With all of the comfort food dishes I’ve been making lately, this Brown Sugar Salmon was definitely a welcome change. Seafood just tends to be a lighter and healthier option, and I try my best to incorporate it into our meal plans at least once or twice a week. 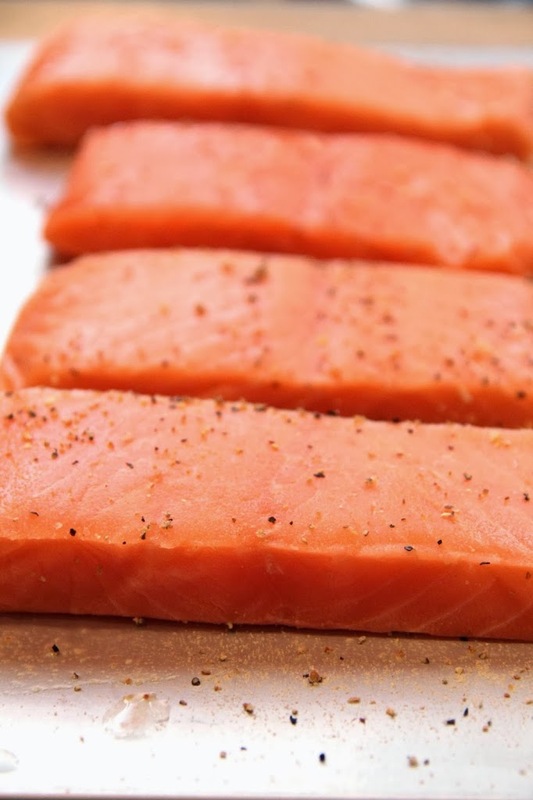 This is my go-to recipe for salmon each and every time I make it. I’ve been making it this way for the last six years and I just have no desire to prepare it any other way. I’ve made it numerous times for dinner parties we’ve had and our guests often comment that it’s the best salmon they’ve ever tasted. 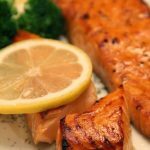 The marinade gives the salmon a lovely sweetness that I just can’t get enough of and it’s SUPER simple to prepare. I purchase my salmon fillets from Sam’s Club. The fillets are skinless and come frozen individually in the bag. I prefer my salmon fillets with the skin already off. I think it just gives the fish a fresher taste and the preparation is quick and easy. 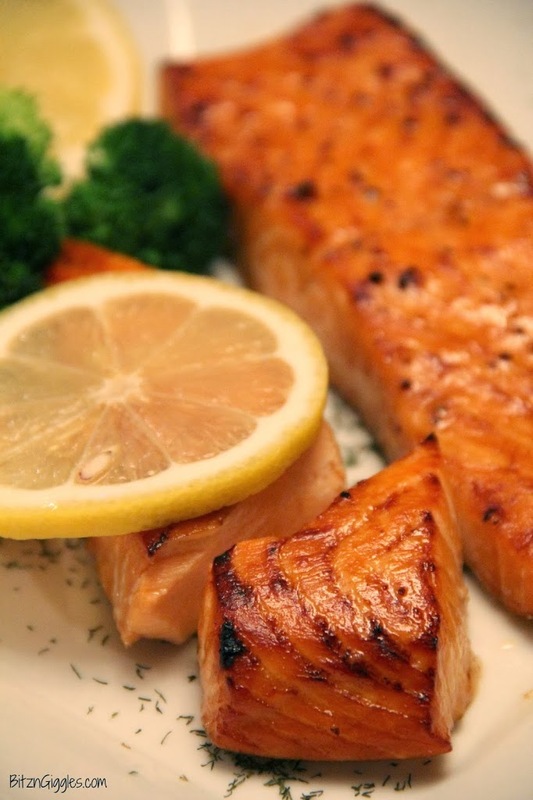 Start by seasoning the salmon to taste with the lemon pepper, garlic powder and salt. In a small bowl, stir together the brown sugar, soy sauce, water and oil until sugar is dissolved. 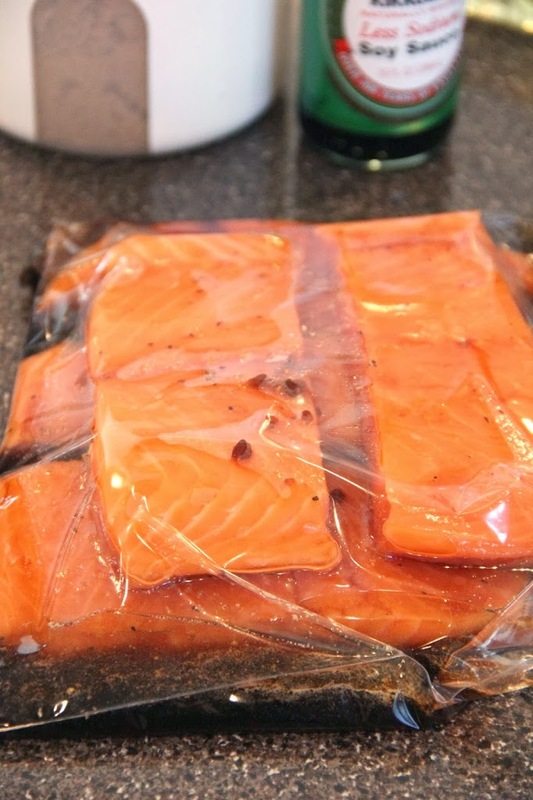 Place the seasoned fillets in a Ziploc bag, pour in the marinade mixture, seal and turn to coat. Refrigerate at least 2 hours. Line a broiler pan with aluminum foil and make a few slits through the foil with a knife to allow juices to drain while cooking. 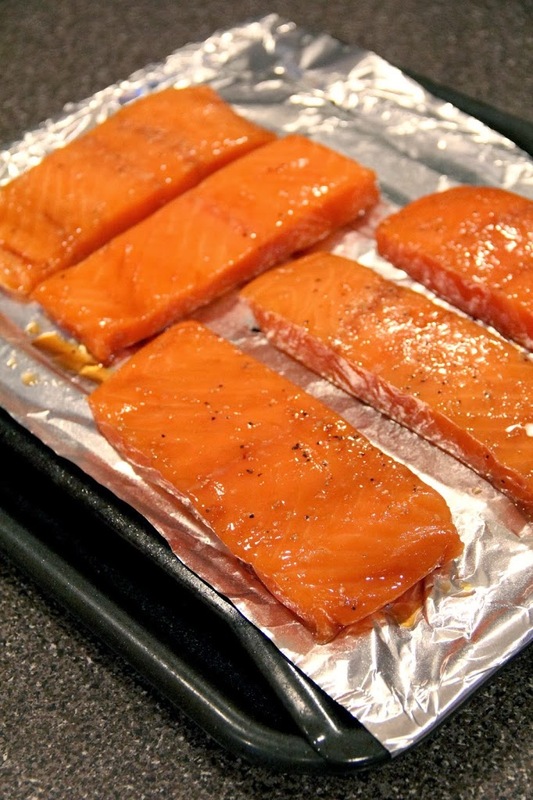 Spray with nonstick cooking spray and place your fillets on the broiler pan. Bake in a 450 degree oven for 15 minutes. Then move the fillets to an upper rack in the oven and broil on high for 5 minutes or until the salmon flakes easily with a fork. In a small bowl, stir together the brown sugar, soy sauce, water and oil until sugar is dissolved. This salmon looks out of this world good! I’d love for you to come link up at Simple Supper Tuesday. A new party starts every Monday night, so you still have time to share at this week’s party. Thanks, Cindy! I’m planning to stop by tonight! Thanks for linking up. I hope to see you next week! Made this tonight & it was wonderful. Do you happen to have a calorie or nutritional info? Unfortunately I don’t have that information, Sara. I’m so glad that you enjoyed the salmon. It’s one of our favorites! Hi Debby, I added a recipe card to the bottom of the post. You should be able to just print out the card now! regarding brown sugar salmon – thank you for recipe!!!! Do you think the recipe would work with other types of fish? Can you cook on a sheet pan if you don’t have a broiler pan? Yes, you can. I would suggest a pan that has sides, however, because some of the juices may run. This looks so good,can you keep it in the refrigerator overnight? Yes! And in fact I recommend you do! The marinade will have more time to soak into the salmon bringing the flavor out even more!